We'll be at several multi-rescue adoption fairs at libraries around the region in the upcoming weeks. These are terrific venues to hold adoption events! Please come on out to meet a wide variety of lovely cats & find your perfect fluffy companion! 10-4:30pm at Kings Park Library - 9000 Burke Lake Road Burke, VA. Thanks to Commonwealth Cat Rescue who is sponsoring this multi-rescue gathering. C'mon out & meet our fluffy sweeties! Our merch booth will also be available for cute & creative cat & dog gifts! CALLING ALL WRAPPERS! - CR!FR will be participating in Borders Books' Holiday Gift Wrapping Program. We will staff a gift wrapping table & wrap customers' purchases for tips. If you'd like to wrap prezzies to help raise funds for CR!FR's kitties & rescue efforts, please join us! The schedule's been divided into 2-hour shifts. No supplies required, you need only to bring yourself. Two people are required for most days, 3 people are needed on Dec 22nd (according to the mgr, this is the busiest time of the busiest day of the year!). Click here for the shift schedule. Thank you in advance for your help - hope to hear from you & looking forward to wrapping with you! In addition, several of CATS RULE! Feline Rescue's cats have had expensive major dental work: Austin, Bella, Pebble & Grimmie had many teeth removed. Please help us to provide the best care for our ailing sweeties, & get out from under the dental vet bills (which ran $3k+). Donating through our CR!FR or Firstgiving websites is simple, fast & totally secure. It is also the most efficient way to support our fundraising efforts. All donations are tax-deductible. THANK YOU for your help! Please join CATS RULE! Feline Rescue at Fairfax City's "Fall for Fairfax Fest" this Saturday, 10-5pm! We will be at Booth #145, which is on University Dr. between Sager Ave. & Armstrong St. Admission is free! There's lots to see & do: creative crafts & artistic wares, food vendors, rides for the kids, music, classic car show, etc. Dogs are invited, too! CR!FR will have plenty of items for animal lovers on sale for fund-raising (still chipping away at the big vet debt! ), including our popular magnets (HUGE selection! ), toy & treat gift bags for cats & dogs, expanded variety of cute & unique dog & cat toys, ornaments (hand-made in the US) and more! We'll be sharing the booth with our friends from PetstoreCruelty.com, the protest/awareness effort against puppy mills & Petland pet stores. We'll both have plenty of free literature to offer on animal issues. It's a large & fun event. The weather should be good so come on out & enjoy! ....AT THE BIG MULTI-RESCUE GROUP ADOPTION EVENT OF THE SEASON! KITTEN & CAT ADOPTION EXTRAVAGANZA! Dozens of kittens and adult cats will be available for adoption on October 6 at Reston’s Regional Library, located on Bowman Towne Center Drive in Reston. The event, sponsored by the SPCA of Northern Virginia, Commonwealth Cats, Dewey Animals Rescue and HAVEN Rescue, will feature adult cats and kittens from 8 to 16 weeks of age. “We will have virtually every type of cat and kitten that anyone could want,” says, June Faris of HAVEN—“Long haired, semi-long haired and domestic short-hairs in a variety of colors—white, black, orange, and gray solids, silver, gray, brown and orange tabbies, calicos, and gray and black tuxedoes. All of these cats and kittens have been vaccinated against distemper and all have been de-wormed. They are simply wonderful and we know just about everyone will fall in love with them." Hope to see you there! CR!FR has lots of beautiful new kittens & cats just waiting to meet you! Saturday, 5-05-07 — Please join CATS RULE! Feline Rescue at the Reston Pet Fiesta! This is a big fun event; lots of awesome pooches & animal organizations attend. We'll be in booth #76, on Market Street, near the corner of Market & Presidents Sts, from 10am - 4pm. We'll have for sale 25+ awesome animal-themed magnet designs for your car, 'fridge, locker, etc., cute cat dolls, lots of neat new dog toys, and more! Plus plenty of FREE informative animal-issue literature. See www.petfiesta.org for more info. The weather predictions sound great - in the low 70s. Hope to see you & your canine companion there! K-9 2K Doggie Expo - from 10am - 12noon. See www.herndon-va.gov/festival/k92kdoggie.html for more info. Hope you can come out & join us for these fun events! 4-29-07 — Thanks to everyone who stopped by our table at the Earth Day/Arbor Day Festival at NoVa Community College! We had great weather for the event & a good turnout. I was gratified that many people picked up plenty of our free literature! I've noticed at events that few people take up the brochures & pamphlets we offer that cover a wide range of issues affecting animals. Perhaps people just don't want to know, or they just don't like to read ;) But knowledge is power, the power to help animals! 3-13-07 — A new pooch has fallen into our laps — meet IVAN! Ivan was living with a family but he was basically being kept in a closed room by himself & his basic needs were being neglected (needs like water, exercise & socialization). The head of the family asked our friend, Hilda, to take Ivan or find him a home & she brought him to us. 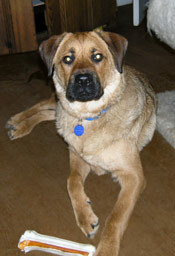 Ivan is a handsome chow/shepherd mix with a red face & legs, spotted tongue & curly tail. He needs some training but he's a wonderful dog! He's super-friendly & playful; unfortunately, he "plays" with the cats by chasing them but he's learning to respect them. Several of the cats really like him (Alfie, Gimli, Niko), several really don't (Austin, Pebble, Natey). He's very different from Maxie but we're getting to know each other & we're glad Ivan's getting the attention he deserves. 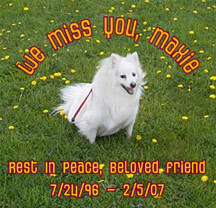 2-05-07 — With a grieving heart I report that our beloved American Eskimo dog Max has passed away. He was diagnosed with kidney failure last March & was doing well until just around the holidays. His condition deteriorated quickly & despite several weeks of care at the Regional Veterinary Referral Center, we lost our wonderful friend & companion. 1-12-07 — HAPPY NEW YEAR!! CR!FR has a full schedule of events & activities planned out for this year. Our main immediate goal is to get out of "vet debt" so we can get back into a busy rescue schedule & continue to plan for expansion at a new facility. We're excited about the great ideas we hope to implement for fund-raising so we can get back to being able to rescue & take in cats ASAP. We will continue to help as many people as possible help cats with TNR assistance, advice & guidance, humane trap loans, referrals, etc. We remain unable, however, to take in any new cats until our budget is back in the black. Nothing is more frustrating than to have to turn away cats in need, I assure you. We are working very hard to pay down this huge debt, which is currently around $7,500. Please consider helping us reach this goal with a donation of monetary support or materials (see our Wish List). Thank You! Also, I have taken a PT job in addition to managing CR!FR so you may notice a delay in responses & updates - please bear with me!